The Fidas® 200 / 200 S models are designed for an outdoor location and to operate with either a low volume flow of 0.2 m3/h or a higher flow rate of 2.3 m3/h to measure the dust values PM1, PM2.5, PM4, PM10, and TSP. The Fidas® 200 is designed for use in a containerized environmental monitoring suite. It is fitted with a 19" rack mounting kit, sigma-2 sampling head, and a simple weather station (temp, pressure and humidity). The Fidas® 200 S is a complete standalone system. The instrument package is housed in an IP65 rated, weather-proofed housing. The weather station package adds sensors for the measurement of wind direction, wind speed, amount of precipitation, and kind of precipitation. An available option adds GPS data for location registration on mobile installations. The relatively compact package is portable allowing ease of relocation to different monitoring sites. In addition to the real time particle size measurement data the instruments can be equipped with a standardized fractionating inlet for PM2.5 or PM10 (manufactured by Sven Leckel Ingenieurbuero GmbH) to allow a gravimetric validation. For either Fidas® 200 model, a user can place a 47 mm filter into the standard 47mm air stream filter holder and instruct the system as to the presence of a PM2.5 or PM10 sampling head. The Fidas® system will then adjust the air flow accordingly and allow for a comparable direct mass measurement. 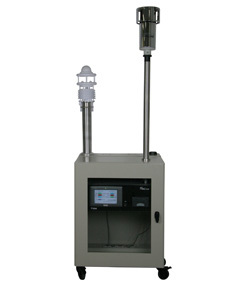 Both models are fitted with an Intelligent Aerosol Drying System (IADS) which mitigates potential measurement errors produced by condensation effects when monitoring in conditions of high humidity. Remote maintenance and data access is also available.